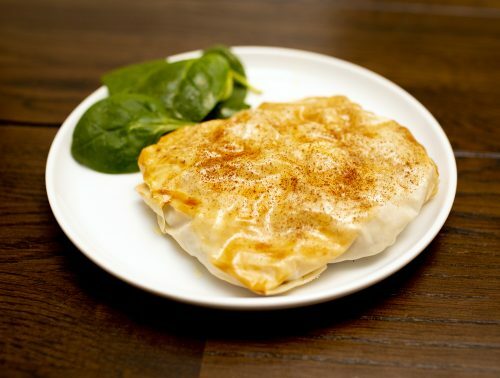 Bastilla (also called Pastilla) is a rustic savoury and sweet meat pie originating in Morocco. This version is from a Persian cookbook and is a bit different than other recipes Iâ€™ve seen. I’ve adapted the recipe to be more exact and to omit onions and coriander, replacing them with other spices. This dish is flavourful, aromatic and each bite has a mix of textures that is just divine. 2. Saute the chicken in a pan with some olive oil on medium-high heat until itâ€™s just cooked through. Drain out the liquid and put the chicken aside. 3. In the now empty pan, return it to medium heat and put in a swig of olive oil, the ginger, dates, and all of the other dry spices. Stir constantly and cook for 3-4 minutes. It should smell fragrant. 4. Remove the pan from the heat and add in the cooked chicken, sugar, honey, and lemon juice and mix it together. 5. Fold in the chopped boiled egg, and add any salt and pepper to taste. 6. Separate the mixture into 4 equal servings. (I used a kitchen scale). 7. Unroll the filo dough and cut the large rectangles in half. Each parcel will be wrapped in 3 half-sheets of filo. 8. Take 3 half-sheets and put the chicken mixture in the centre. Flatten the mixture slightly, still making sure you can cover it completely with the filo dough. 9. Fold up the filo edges around it to completely cover the chicken, and then seal with egg white. Flip the parcel over and place on a baking sheet. 10. Repeat for each parcel, wrapping it, sealing with egg white and flipping it over. 11. Brush all of the parcels with egg yolk on the top, and put a small sprinkle of cinnamon. 12. Bake for 22 minutes – the parcels should be golden brown. I served this with green beans on the side, but it would also go nicely with a lightly dressed salad. Adapted from â€œPersiana: Recipes from the Middle East & Beyondâ€ by Sabrina Ghayour.